After the fire last weekend at Broadview and Gerrard, streetcar service is still diverting with shuttle buses filling in the gaps. We took it down in a day, but dismantling something is much different than re-building something that needs to last for many years of safe/reliable operation. The entire workscope is complicated because it’s not just the trolley wire. We also had to cut feeder lines (larger power distribution cables) as well as negative returns on the south side of Gerrard and these need to be restored which is more significant than the trolley wire and span wires. This is more than half of the overall work. One of the sidewalk poles right next to burned building that suspends our wires (plus hydro, traffic lights) should also be replaced. Not overly complex but additional work. And since this is what holds up (literally and figuratively) other aspects of overhead work there is a logical sequence that needs to be followed. The trolley wire and spans are somewhat straightforward. The offset of Gerrard Street at the Broadview intersection adds a bit of challenge, but it’s not too serious. The fact that it’s not exactly straight just another wrinkle on top of something already difficult. Choosing to do the curve later probably saves us a shift (shift and a half maximum) but we would need a closure at a later date to complete it and we’re just deferring that amount of “pain”. The deferred closure would of course be longer than a shift because we would need to remobilize. Although nobody likes to hear it, we also have human resource constraints and labour laws to follow. The work involves multiple crews working simultaneously throughout the process and we need to ensure they are getting the legal amount of time off between shifts. I followed up asking whether the intersection would be built “pantograph friendly”, but it turns out that the design work for this location has not been done yet. The intersection will be rebuilt with standard overhead and converted at a future date. When the City gives the TTC clearance to begin working, the TTC will issue an updated notice about the diversions. How did the TTC, or TRC, handle fires without buses? Likely, there were more streets available that had tracks on them, but there were less track diversions available outside the downtown area. Steve: The distinction is that this was not just a fire, but one that has closed a major intersection for a week. I suspect that 100 years ago, more of the building would have burned down, the delicate sifting through the ruins would not have happened, and what was left would have been knocked down in short order. It was in the Star where I believe it was stated they would have it up and running “in a day” once the scene was cleared. Apparently not! The loss of the building that housed a chinese corner supermarket is hearbreaking. At best. Something this size would have had a very good possibility of turning into a disaster on the scope of the 1904 fire. That said, I can’t say I’m impressed by the comments they made to the Star that they would be up in a day only to admit later that no, it would actually take considerably more. The TTC is fortunate that this fire didn’t happen during the reconstruction of the Broadview and Queen junction. Now that would have been a real mess. I used to take the streetcar past that building on my way to elementary school in the mid-’80s. I remember the sign running above the main floor. I had no idea what it meant but I found the words interesting. More recently I noticed it had been mostly covered by a newer sign but the original was still underneath. I believe that is also where they had barrels and crates of food for sale out on the sidewalk. It gave a feeling of being a distinctly different food shopping experience compared to the grocery stores I use. Just down the street is a bakery where I regularly take the kids when we visit Toronto. Everything is so inexpensive I can basically let them point at stuff, put it all on the tray, end up with a huge bag of food we can barely carry, and still get change back from a $20. I hope the re-development is something that fits into the character of the neighborhood. Steve: Having lived at Broadview and Danforth for over 30 years, I have seen various generations of signs appear and disappear on the stores down at Gerrard, but the type of business remains the same. Yes, I hope whatever goes in there fits because this will likely trigger pressure on other landowners in the area. The west side of the street never seems to do as well as the east, and there are several empty, or underused, storefronts there. Last Sunday, when I took a eastbound 505 car, the operator asked everyone to transfer to a shuttle bus at Dundas & Parliament. The shuttle buses seemed to be scarce and I suspect that it might have been faster to ride the streetcar around the loop (Parliament -> Queen -> Broadview -> Dundas) to get to Dundas & Broadview. Since the TTC says the 505 will go around that loop, I’m wondering why we were asked to leave at Parliament. Perhaps it just simplifies explanations. Parliament was very busy with streetcars turning in various directions especially between Dundas & Queen. Steve: I find that the operators on the diversions generally don’t mind provided that folks actually understand and explain where they are headed. There are many problems with the number of non-English speakers in this part of the route, and even those who do understand the language can have trouble understanding how the replacement service works as it’s rather complex. The TTC is supposed to be putting up multilingual notices in areas with a high concentration of non English speakers, but this practice seems to have fallen through the cracks. Obviously the fastest way for you to get where you were going was to stay on the streetcar rather than taking two separate shuttle buses, one to River, and another over to Broadview. The fruit/vegetable trays that openly face the main streets gives many neighbourhoods in Toronto (including East Chinatown) a village-like atmosphere. I went by there today, and it looks like the exterior of parts of the same building remain standing. I have no idea what condition the interior is in. I can only hope that what gets built matches the rest of the building that remained standing, or at the very least restores the open fruit trays that face the main streets. Would it make sense for the TTC to interline 504/505 streetcar service during this delay such that Eastbound 505 would return westbound 504 and vice-versa? Streetcars waste time looping around Parliament, and this arrangement would reduce the number of bus shuttles necessary. Granted some cars would still loop via Parliament as 504 has higher service levels than 505. Steve: To interline the routes formally would require a new schedule for an event that was expected to last only a week at most, and would create an extremely long route. I have noticed that with the shorter route (because no streetcars go to Broadview Station), the service on the 504/505 is somewhat better because everything is being short turned. I’m not sure that your proposal actually “fixes” anything. Are you proposing that the 505 Dundas sees only eastbound service, and 504 King sees only westbound service? Or both 504 and 505 see both eastbound and westbound? Steve: What he proposes is that an eastbound King car would become a westbound Dundas, and vice-versa. In effect, the route would be a very long, thin “U” making round trips from Dundas West to Dundas West. As he notes in his comment, there is a problem with unequal levels of service on the routes. This would be “fixed” by having some cars stay on King. In any event, there are other reasons this is not practical for a short-term diversion arrangement as I already mentioned. I noticed that you brought up the topic/briefly mentioned that the TTC was suppose to put up multilingual signs in areas where English is not the predominant language spoken. Could you explain more about this project that was suppose to implemented but has like so many things with the TTC fallen off the path. When you mentioned multilingual signage the first thing that came to my mind was seeing in person the multilingual signs on the MTA, was the TTC trying to replicate this? If so I’m kind of surprised that the TTC wasn’t the first transit system to do so since the city does have a high multicultural background. Steve: Many years ago during a big track project on Gerrard, the local Councillor got the TTC to put up multilingual signs in recognition of the large Asian population there. This was supposed to be a standard, but like so much that seems to have been forgotten from the Giambrone era, this too fell off of the table. With the recent diversions, I have noticed an inconsistency in how the TTC handles things. In some cases, there are big signs and lots of maps (albeit only in English), and in others we’re lucky to get a hand-lettered poster. I am not sure why there is such inconsistency and will take this up with TTC to find out why they are failing so badly on “customer information”, supposedly one of their top priorities. In terms of service, with the 504 route temporarily reduced by 1.8 km (14%), the 505 route reduced by about 1.3 km (12%), and 506 increased by 1.5 km (10%), hopefully TTC have had enough common sense to take some of the excess cars off 504 and 505 and add to 506, for the duration of this. The decline of the small Chinatown in this area is unfortunate. Broadview/Gerrard, as well as the much larger Chinatown on Spadina, seem to be in decline because so many of the Chinese businesses seem to be migrating to Markham, Richmond Hill and northwestern Scarborough where there isn’t very much transit service. I have to admit, until streetcar service is restored, it’s hard to take that business as usual sign on Gerrard seriously. One thing that really stuck out was that the notice on the web site actually included a map. I thought this used to be pretty typical, but they seem to have been relying almost exclusively on text descriptions lately. I am sure that the text descriptions are required for accessibility reasons, but I would think it would be easier for a lot people to understand short-term diversions for construction by looking at a map (and easier to figure out options for other alternative routes, as well). Steve: The map appeared on notices on stop poles recently. So at the moment, between construction on Queen at Victoria, on the Harbourfront, on Kingston Road, and detours due to the fire at Gerrard and Broadview, only 3 of the 11 streetcar routes are NOT on diversion. This must be a record (ignoring power outages). Steve: The construction on Queen is at York. Broadview & Gerrard is partly open again as I write this reply. King & Spadina will close for reconstruction in August. Enjoy! Steve, what does the LRT “Transit city” vehicles hold, compared to these new streetcars? Today’s article said the crush load is 250… how does that compare to the Metrolinx green LRT’s? Steve: They are similar cars although the Metrolinx cars have doors on both sides and this will displace provisions for cyclists and wheelchairs/scooters from the “off side” of the vestibules with a loss of some seating. I doubt we will see 250 people on one of these cars (of either flavour) very often. I was off work last all week but rode in to work today and noted the 506 was running eastbound between Coxwell and Broadview as I was cycling westbound. Also saw a northbound streetcar crossing Gerrard as I was nearing the the affected intersection. Initially I thought service had not yet resumed, as I was just behind westbound streetcar as I was approaching the jog at Coxwell but after doing my version of the jog (straight on Fairford, then south on Rhodes) I did not see that streetcar turning on to Gerrard from Coxwell. One other note – I saw first hand the two-streetcars-in-a-row as I was approaching Main – one was turning right onto Gerrard as I waited for the light to change, then saw another about to make a right just behind it. I’m wondering if this is a deliberate scheduling for the AM? Steve: Two streetcars in a row is not deliberate scheduling. It just sort of happens like that. Fate. 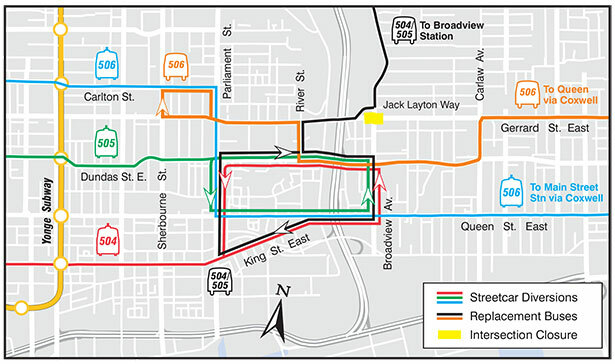 While Broadview Avenue was scheduled for a 2013 overhead replace, Gerrard Street East was scheduled for 2015 (west of Broadview) and 2016 (east of Broadview). Did the TTC sneak in some overhead upgrades around the Broadview/Gerrard intersection, or did they follow their schedule without deviation? Steve: The only work that was finished off as part of this job was already in progress. All intersections will eventually have insulating sections on the approaches. Normally these will be bridged with a jumper, but in the event of an emergency, selected jumpers can be removed to isolate parts of the line. This gives more flexibility to maintain partial service than shutting down all directions. Surveying marks for pantograph-compliant overhead have appeared at all three intersections on Broadview, but I don’t know when the actual installation will occur. Some preliminary work (new contact wire) has already been done at Dundas. I have to wonder why the OFM or other organizations are allowed to disrupt so much of the public transport network for so long. Closures and delays caused by fire or police investigations seem to be a not-uncommon occurrence. 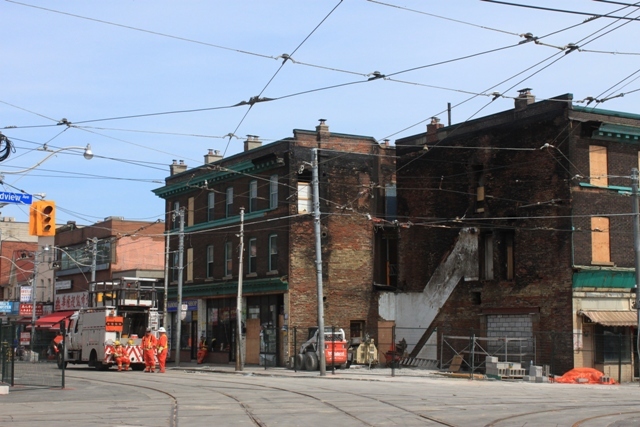 I recognize that you’d need to divert streetcar service and kill power while the fire is in progress, but surely once life and property are secure, the next emphasis should be restoration of public transit. I don’t see why buildings couldn’t be shored up and the service resumed fair more quickly. Is is just that the people running these organizations (OFM, police, etc) aren’t transit users and don’t understand how many people rely on the TTC/GO/etc. It just strikes me as another example of how the scale of public transit isn’t appreciated by those in power. Now that the remains of the building have been removed, the corner still has a bit of the built up look to it. It has a long way to go before the windswept emptiness of the most 905 intersections. I’m guessing that it’ll be some time before something rises like a phoenix at that corner. Hopefully not a one or two-story Phoenix, Arizonia-like building, set back from the street. I walked by the Dundas and Broadview intersection a few weeks ago and it looks like that intersection is done. However I remembered this thread and it raised the question of why there was no pantograph friendly design for Gerrard ready to go when the 505 was supposed to be one of the first routes converted in 2014. Steve: The schedule for overhead conversion that I have seen in previous capital budget plans did not make sense when compared with the planned rollout of the new cars. I am waiting to see the 2014 version (soon) to compare the track, overhead and streetcar rollout plans. Work is now in progress on Queen & Broadview.